by Martin Crawford. Are you wondering which productive trees to plant in your garden? Or are you planning a forest garden? Perhaps you are planting an orchard but want a greater diversity of useful trees than is common? 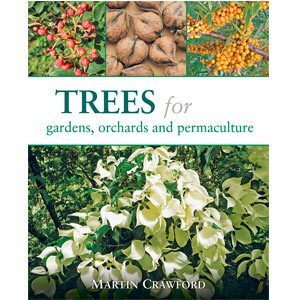 Or do you want to know what unusual fruit trees you can use? The answers to all these questions can be found here. Are you wondering which productive trees to plant in your garden? Or are you planning a forest garden? Perhaps you are planting an orchard but want a greater diversity of useful trees than is common? Or do you want to know what unusual fruit trees you can use? The answers to all these questions can be found here. Each of the trees or tree groups include details of Origin and history, Description and uses, Varieties/Cultivars, Cultivation, pests and diseases, Related species, European and North American suppliers; Colour photos accompany every entry.There are over 180 colour photographs throughout and 65 tables.